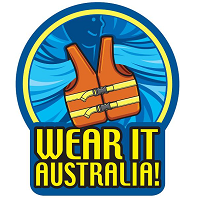 Lifejacket Attached To Sinking Boat Saves Fisherman | WEAR IT AUSTRALIA! 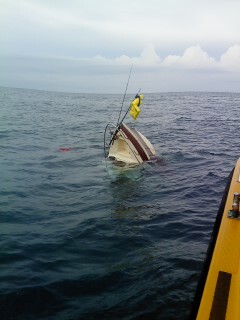 The submerged vessel with the fishermen’s makeshift lifejacket signal flag. An offshore training exercise for New South Wales Marine Rescue Shellharbour turned into a quick-response rescue operation when the crew of a sinking boat made a Mayday call on Saturday morning. The half-cabin boat with two fishermen on board had begun taking on water in choppy seas with big swells about two nautical miles off Shellharbour and the bilge pump had failed. The skipper barely had time to call for help before several bigger waves swamped and capsized the boat. Marine Rescue Port Kembla relayed the Mayday call to the Shellharbour crew, aboard “Shellys Rescue”, who began a search pattern to cover the area where the vessel was believed to have capsized. The two fishermen were wearing lifejackets and managed to rig a fishing rod with another life jacket attached as a makeshift signal flag. With enough buoyancy trapped in the vessel’s bow, it had settled in the water but was still difficult for searchers to see in the rough conditions. MR Shellharbour Skipper Peter Kefts and crew members, Fred DeClosey, Christopher Norris, Gerry Kelly and Geoff Troth (from Lake Illawarra unit), spotted the vessel, with the tip of the bow still above water, after 40 minutes. “When they realised they were in trouble, the two men did everything right to help themselves,” Mr Kefts said. “They wore lifejackets, they used their marine radio to call a Mayday and they stayed with their boat. The Marine Rescue crew then returned to the semi-submerged fishing boat, securing it for a slow tow back to shore. “It wasn’t the training exercise we set out for but it was a very satisfying alternative and I’m very proud of every crew member and the way they responded,” Mr Kefts said. In another Illawarra incident the previous afternoon, Marine Rescue Port Kembla answered a call for help from a 35 ft (10.7m) yacht six nautical miles offshore. The yacht, recently purchased and on a delivery voyage to Victoria, had suffered mechanical problems and crew sickness and was not making way under sail. Port Kembla 30, the unit’s new rescue vessel, sped to the scene and towed the yacht to safety. 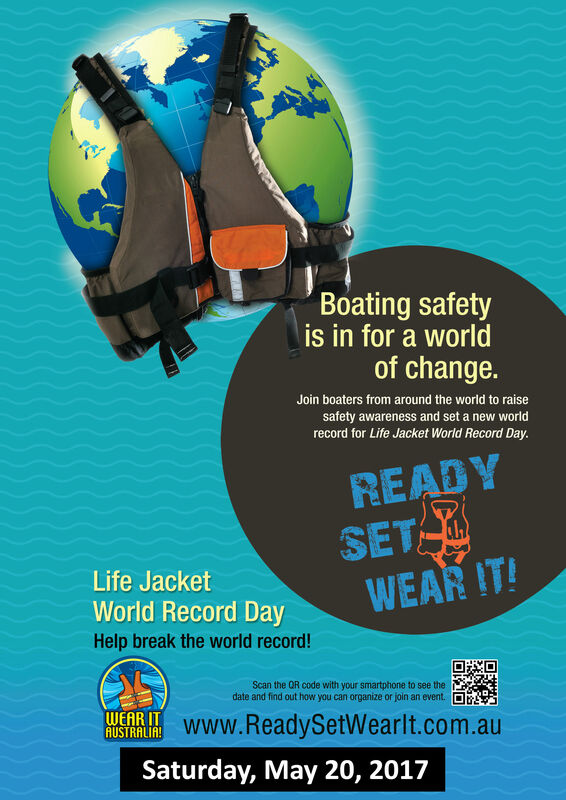 Always have your lifejackets on regardless how far off-shore you go. You don’t have to be far off-shore to get into trouble. Know what equipment is available to make a Distress Call. Know your location at all times. All crew on board need to know what a Mayday Distress Call is. 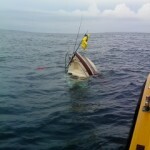 Stay with the sinking vessel as long as possible – don’t swim away from it. Use bright coloured debris to signal with. Marine Rescue are there to save Life at Sea, not the vessel. ← Serious implications for all commercial fishing operations.